Accommodation for Art & Design is provided in a suite of rooms within an Annexe block, which is shared with the Music and Design & Technology Departments. The main teaching area on the ground floor comprises of a general art room and pottery workshop with kilns and storeroom beyond. There are also facilities for computer-aided design work, both within the department and in a computer room, providing individual, and group work. The Art & Design Department is a popular subject within the school. We have high standards and give students every opportunity and encouragement to learn and succeed in this subject. At Key Stage 3 we focus on skills in drawing, painting and 3D modelling. Students learn to keep a sketchbook where they research artists, experiment and develop ideas. Each year group works under a central theme which is broken into short technical blocks building towards a sustained final project. Baseline assessment task Students will create their own version of the painting, ‘The Scream’ by Edvard Munch. Students will research into the work of this artist, and investigate the meaning behind this painting. They will use this knowledge to design their own version of ‘The Scream’. Still-life – Cubist Style Students develop their ability to use and understand the visual language of Cubism and build this knowledge into creating a Cubist guitar made out of card and mixed media. Letterform Designs Students combine the disciplines of calligraphy and digital design. They will examine how letterforms interact with each other, creating a myriad of visual interest and making their typographic designs unique. Jungle Scene Students begin with a block of initial observational studies of plants and trees, including drawing, painting, collage and mixed media which are then combined with visual research and a critical analysis of the painting ‘Surprise’ by the artist Henri Rousseau. Students are encouraged to develop their own Jungle Scene ideas, refining the use of their preparatory ideas, leading up to producing their final outcome. Imaginary Landscape Students investigate their own local and school environment and design images that will interact with those spaces. Students apply their use of visual language in a real context, considering cultural diversity and aspects of identity. Hair Today Students use photographs of the back of their heads and develop their drawings using the photographs as a reference image. Students then developed a background for them to be looking at. Students select a colour scheme that communicates and informs the background environment that they drew themselves in. Pop Art and Public Spaces Students are encouraged to explore the many and diverse examples of sculptures in the public arena. Various artists are researched and the purpose of public sculpture is examined. Using Photoshop, students create their own virtual sculpture which is placed on the ‘Fourth Plinth’ in Trafalgar Square, London. Broken Faces Students research into the work of various artists who use portraiture as their main theme. A number of experimental studies are developed building towards a final outcome. Mixed Media/Layers – Ordinary to Extraordinary Collage Students select an object of interest using symbolism. They create multiple original drawings to incorporate into their mixed media work. They research narrative/symbolic works and mixed media works. They then draw from life in their work and use the compositional skills they have learned into a final outcome. At Key Stage 3, students are timetabled for one double lesson (two hours) of Art per fortnight, and are taught in mixed ability groups. How much homework can students expect? In Art, homework is set once every two weeks and tasks will normally take approximately 30 minutes to complete but they can take longer. There are a great variety of homework tasks such as observational drawing, collage, mixed media work, among others. Parents can help students through encouragement and praise, monitoring homework tasks and purchasing additional art equipment which may help. 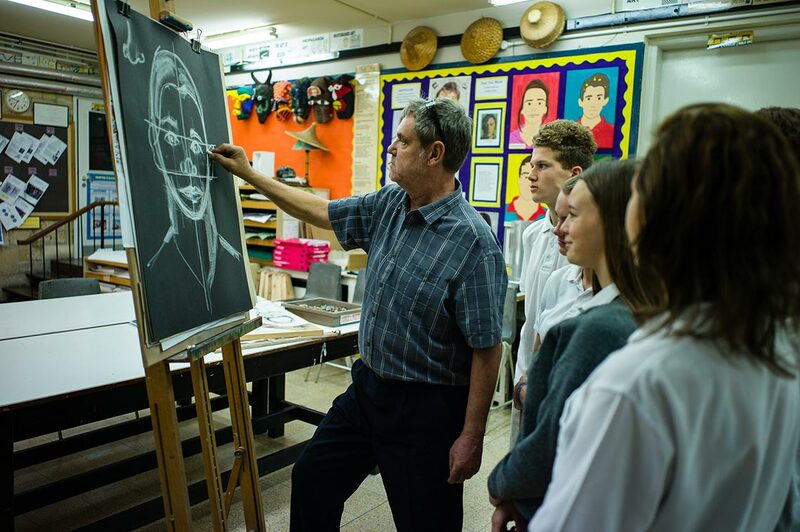 Art & Design is a challenging subject that develops each student’s ability to appreciate the visual world and to respond to it in a personal and creative way. The GCSE Art, Craft & Design course aims to enable all Year 10 and Year 11 students to demonstrate growth and development of their creative powers and visual understanding. Art Classes are organised as mixed ability groups, following a syllabus leading to a common examination at the end of two years. The Year 10 course seeks to develop and improve students’ skills and understanding of various art disciplines. Drawing is an important part of the course alongside painting, design work, mixed media, three dimensional works and a study of artists and their work. Several pieces of work are undertaken in Year 10 and students are expected to prepare for these using sketchbooks. Homework is set once a week and is an integral part of the course. In Year 11, students will use all the skills and knowledge developed in Year 10 to produce more individual based pieces of work and they are able to select the media and methods with which they wish to work. The best work from Year 10 and Year 11 will be selected as the work to be assessed for the Controlled Assessment unit 1. It is important that students work hard at all times, as potentially, any of the work produced over the two years could be selected. Intimate Portrait “A Look at Human Behaviour”. Students are encouraged to make the ordinary moments extraordinary. Looking at human nature can be very interesting when looked closely. Students create a figurative work based on a simplistic time in a friend or family member’s life. Students aim to connect the viewer with the person represented in the work. Reflective Identity Students create a self-portrait and incorporate the idea of “reflective identity” or how others perceive them. Students research the theme of identity in artist work and how the artist subtle acknowledgments of identity are represented. The idea of “Reflective” is open to interpretation. Still-Life and Natural Forms Students make a number of observational studies from chosen objects, such as shells, wood and fruit. Students are encouraged to research into artists who use still-life objects and arrangements in their work. Students develop final pieces using mixed media 3D structures. For the Externally Set Timed Test, there will be a sustained focus period of 10 hours under examination conditions in which students produce their final response(s) to the examination theme. In Component 1 (portfolio) students develop responses to initial starting points, project briefs or specified tasks and realise intentions informed by research, the development and refinement of ideas and meaningful engagement with selected sources. Responses will include evidence of drawing for different purposes and needs and written annotation. What’s assessed: A portfolio that in total shows coverage of the four assessment objectives:AO1: Develop ideas through investigations, demonstrating critical understanding of sources. How is student’s work assessed? At the end of the two year course in Year 11, each student displays their work in an exhibition showing their best work from their coursework and work completed during their externally set assignment. For the Externally Set Timed Test, there will be a preparatory period followed by 10 hours of supervised time under examination conditions in which students produce their final response(s) to the examination theme. All students’ work is marked by the school and moderated by AQA during a visit. Usually, a GCSE pass at grade ‘C’ or above in Art is required. A commitment towards improving drawing and other skills is essential. Students will be expected to show the maturity to work in an independent, conscientious manner. Students must be prepared to make good use of study time. This exciting and challenging course builds on the knowledge and skills acquired at GCSE and focuses on the full range of art and design practice and the integration of theoretical knowledge and understanding. The GCE in Art and Design has been designed to ensure that not only practical artistic skills and abilities should be developed in any course of study, but also that the study of art and design and its various contexts should form part of any student’s education. Therefore, in addition to making artefacts, students are encouraged to reflect on their own work and on the work of others. At the start of the course we will promote a wide range of recording skills followed by a variety of experimentation. A selection of thoughtfully presented work that demonstrates the breadth and depth of the course of study. At least one extended collection of work or project, based on an idea, concept, theme or issue. This should demonstrate the student’s ability to sustain work from an initial starting point to a realisation. It should include evidence of their ability to research and develop ideas and link their work in a meaningful way to relevant critical/contextual materials. This is a practical investigation supported by written material. Students are required to conduct a practical investigation, into an idea, issue, concept or theme, supported by written material. The focus of the investigation must be identified independently by the student and must lead to a finished outcome or a series of related finished outcomes. The investigation should be a coherent, in-depth study that demonstrates the student’s ability to construct and develop a sustained line of reasoning from an initial starting point to a final realisation. The investigation must show clear development from initial intentions to the final outcome or outcomes. It must include evidence of the student’s ability to research and develop ideas and relate their work in meaningful ways to relevant critical/contextual materials. The written material must confirm understanding of creative decisions, providing evidence of all four assessment objectives. Be a coherent and logically structured extended response of between 1000 and 3000 words of continuous prose. This will consist of a choice of questions to be used as starting points. Students are required to select one. Coverage of all four assessment objectives must be evident. At the end of the two year course in Year 13, each student displays their work in an exhibition showing their best work from their coursework and work completed during their externally set assignment. Initially, students generally attend a one-year Art Foundation Course in which they will sample various art and design disciplines. From these experiences, they will select an area of art specialism and apply for a three-year BA (Hons.) course in this subject area. Examples of art and design specialisms include: Fine Art (painting, sculpture), Graphics, Illustration, Computer Design, Three Dimensional Industrial Design, Fashion and Textiles, Interior Design and Photography. It is also useful to study Art when considering a career in architecture. Careers in these areas are possible but it must be stated that art and design is a highly competitive field and only the most committed succeed.